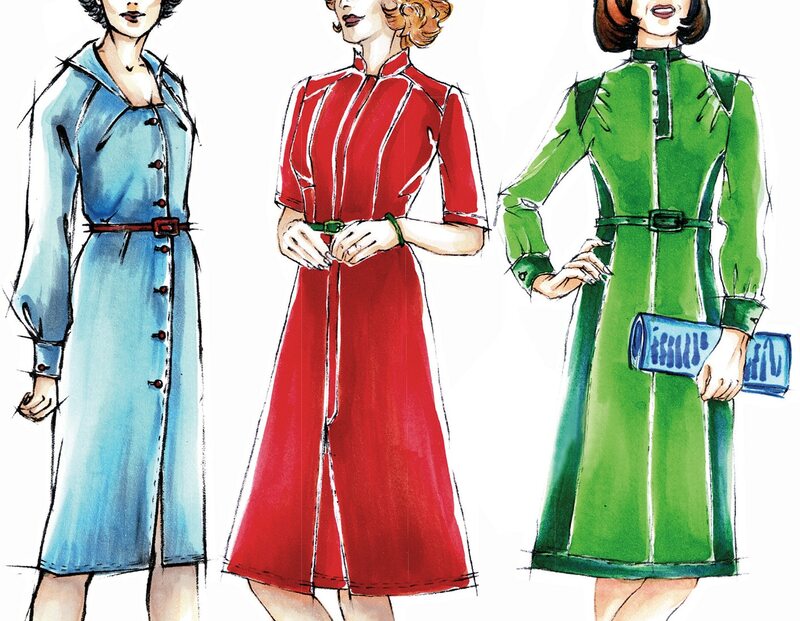 For a figure with a narrow waist and relatively wide hips, add the missing width at the hip line not only at the side seam but also at the centre back and at the back panel seam. Taper the centre back less at the hip than usual. Here 1-1.5 cm at the hip instead of 2 cm at the waist and hip. For a design with back panel seam, add part of the missing width not only to the side seam but also as overlapping seam lines to the back panel seam. 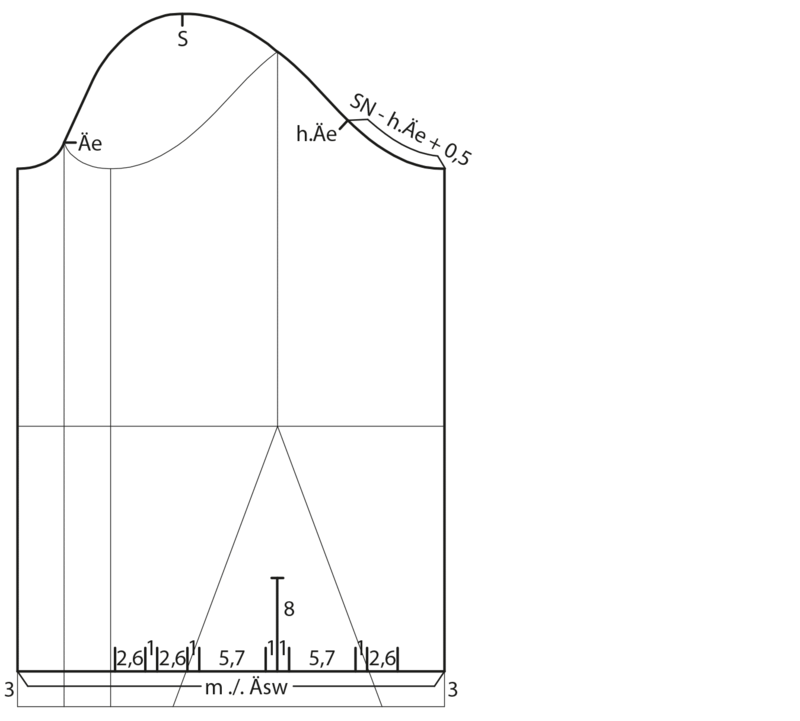 On a vertical line, measure the scye depth (Rh), the back waist length (Rl), the hip depth (Ht) and the length (Lg) from the neck point W downwards. Square out to the left from all points. Taper the centre back 2 cm at the waist and 1.5 cm at the hip and draw the centre back from the neck point W to the hem. On the chest line, measure the back width (Rb) plus ease, 2/3 of the scye width (Ad), 8 cm gap, 1/3 of the scye width and the chest width (Bb) plus ease from the centre back to the left. Square down from all points. The centre front is the perpendicular line at the chest width. On the chest line, measure 1/10 of the chest girth plus 0.5 cm from the centre front to the right. Measure the neck width to the left for the back neckline and square up 2 cm. Draw the back neckline. Measure 1 cm downward from the intersection of the neck width line and the back width line for the shoulder slope. Draw the shoulder line and extend it 1 cm towards the armhole. Mark the halfway point of the armhole height and divide the lower part of armhole height in half. Measure 1.5 cm to the left. Square out to the left at 1/4 of the armhole height and draw a perpendicular guideline to the front pitch line. Measure the back width line from the chest line to the shoulder line and transfer this measurement minus 2 cm to the front armhole height. Draw a circular arc with pivot point at the front pitch line over the armhole height and measure 1/10 of ó chest girth along the circular arc to the right for the front shoulder length. On the bust dart line, measure the front length II (Vl II) from the waist line upwards and the bust length II (Bt II) downward from this point. Draw a circular arc over the front length with pivot point at the bust point (Bt). Measure the back shoulder width (m1) minus 1 cm from the shoulder point of the first arc to the second arc (ü1). 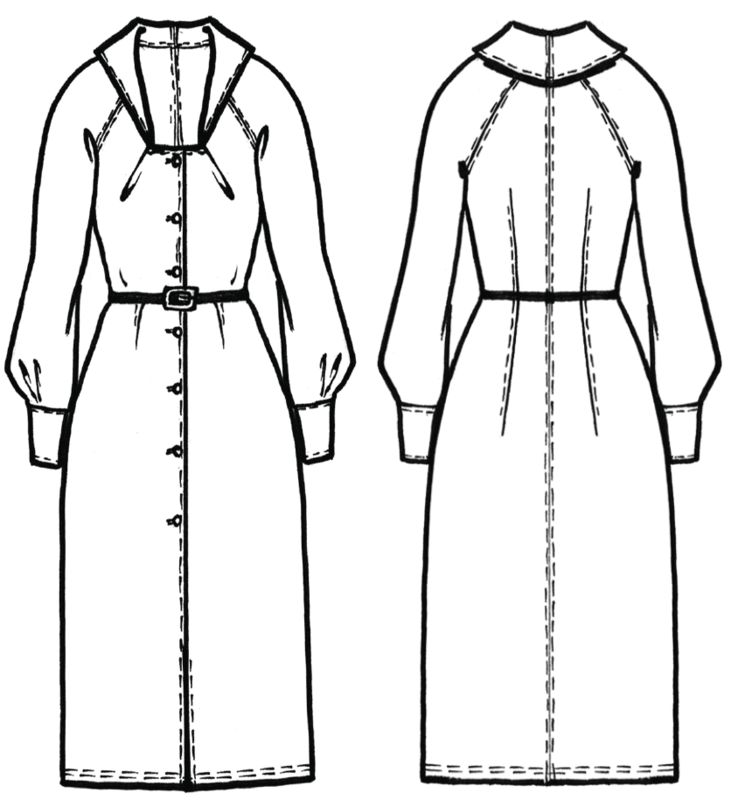 Draw the front and back armhole as shown in the illustration. Measure the neck width minus 0 cm from the centre front to the right and the neck width plus 1 cm downward. Draw the front neckline. Measure the distance from the neck width to the bust dart line (m2) and transfer this length to the shoulder line (ü2). Draw the right bust dart leg and transfer the length (m3) to the left bust dart leg (ü3). Connect this point and the neck point with a straight line. On the front pitch line, measure 1/4 of the scye width from the chestline upwards and mark the front armhole notch (Äe). On the waist line, measure 1/4 of the waist girth minus 1 cm from the front pitch line to the left. From this point, measure 1/2 of the waist girth plus 2 cm to the right. Omit the gap. On the hip line, measure the same distance as on the waist line plus 2 cm from the front pitch line to the left. From this point, measure 1/2 of the hip girth plus 2 cm to the right. Omit the gap. Mark the front waist dart with the determined front intake (here 1 cm). Distribute the back intake (here 6 cm) to the side seam and the back waist dart. Raise the waist 1 cm at the side seam and taper the side seam 1.5 cm at each side. On the waist line, measure 1/3 of the back width plus 1 cm for the position of the back dart intake. Mark the intake with 3 cm and draw the dart middle line 15 cm upwards. The missing width at the hip is 1 cm at the centre front and 5.5 cm at the centre back, a total of 6.5 cm. Add 1.5 cm at each side seam and the remaining amount at the back panel seam (3.5 cm). The back pattern overlaps at the back waist dart and a seam line is necessary to separate the overlapping pieces. Relocate the shoulder seam 1 cm to the front. On the waist line, mark the position of the front panel seam 8 cm away from the side seam. Cross out the front waist dart and relocate the dart intake to the front panel seam. Draw the front panel seam to the armhole, ending 2 cm above the front armhole notch. Draw the back panel seam from the back waist dart to the intake at the armhole. Draw two circular arcs with pivot points Z1 and Z2 for the hem extension. Measure 2 cm to each side. Draw a parallel line with 6 cm distance to the hem line. Mark the front shoulder yoke 8 cm wide at the shoulder and 7 cm wide at the armhole. Draw the curved yoke line as shown in the illustration. Divide the yoke seam in four equal parts and draw three cutting lines to the bust point. Relocate the bust dart intake in equal amounts to the cutting lines. Lower the neckline 0.5 cm at the shoulder and at the centre front. Draw the overlap and underlap parallel to the centre front according to the illustration. Close the intake at the armhole. Measure the back armhole height from the shoulder vertically to the chest line. Measure the front armhole height from the shoulder to the intersection of front pitch line and chest line. Add both measurements. Measure the armhole circumference from the front shoulder to the back shoulder. 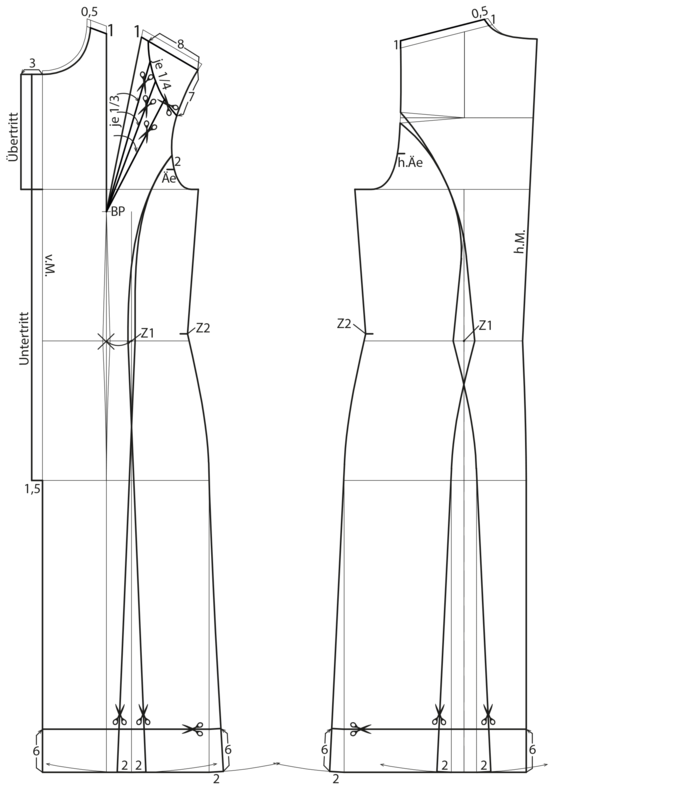 Calculate the sleeve measurements according to the measurement chart. 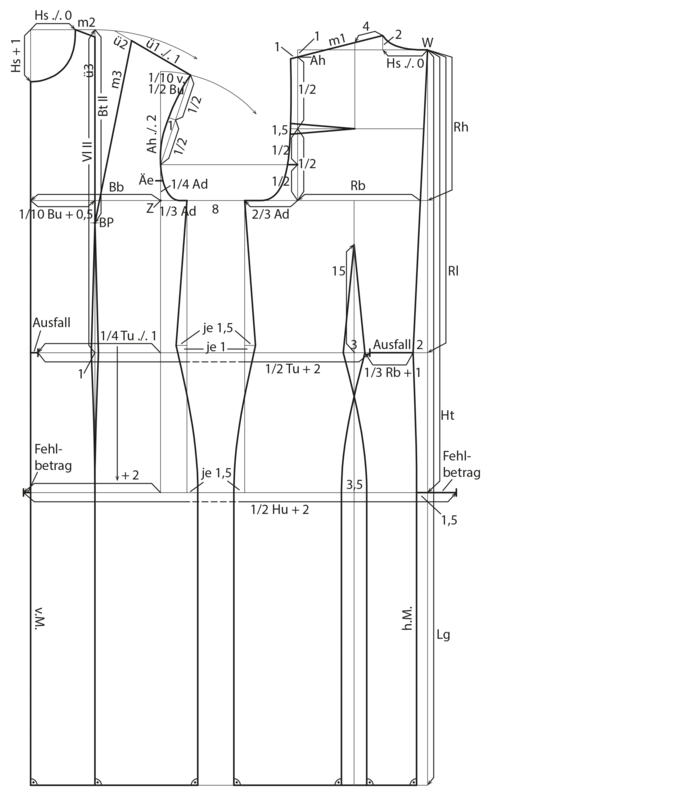 Measure ó of the armhole height downward on a vertical line. Measure 2/10 of the scye width plus 2 cm downward from the starting point for a lower sleeve cap. From this point, measure the sleeve length downward. Measure the distance from the armhole height to the hem (m1) and transfer half of this amount minus 1 cm downward (ü1). Square out to the right from this point for the elbow line. For the front armhole notch measure . scye width upward. 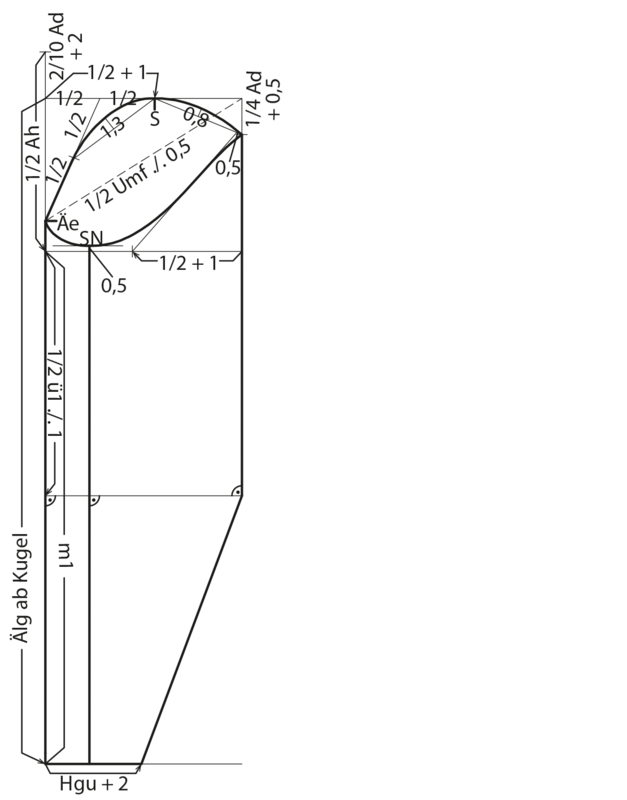 Measure the ó of the armhole circumference minus 0.5 cm from the front sleeve notch diagonally to the original line and square down to the elbow line. Divide the original line in half and measure 1 cm to the right for the shoulder point. Measure the same amount to the left on the biceps line. Mark the halfway point between the starting point and the shoulder point and draw a guideline to the front armhole notch. Draw another guideline from half of the first guideline to the shoulder point. From the sleeve width, measure . scye width plus 0.5 cm downward and draw a guideline to the shoulder point. Measure 0.5 cm from the vertical line along the guideline and draw the next guideline for the lower sleeve curve slanted to the bicep line. Raise the bicep line 0.5 cm and transfer the lower sleeve curve from the front armhole notch to the side seam to the raised bicep line. Mark the side seam and square down to the hem line. 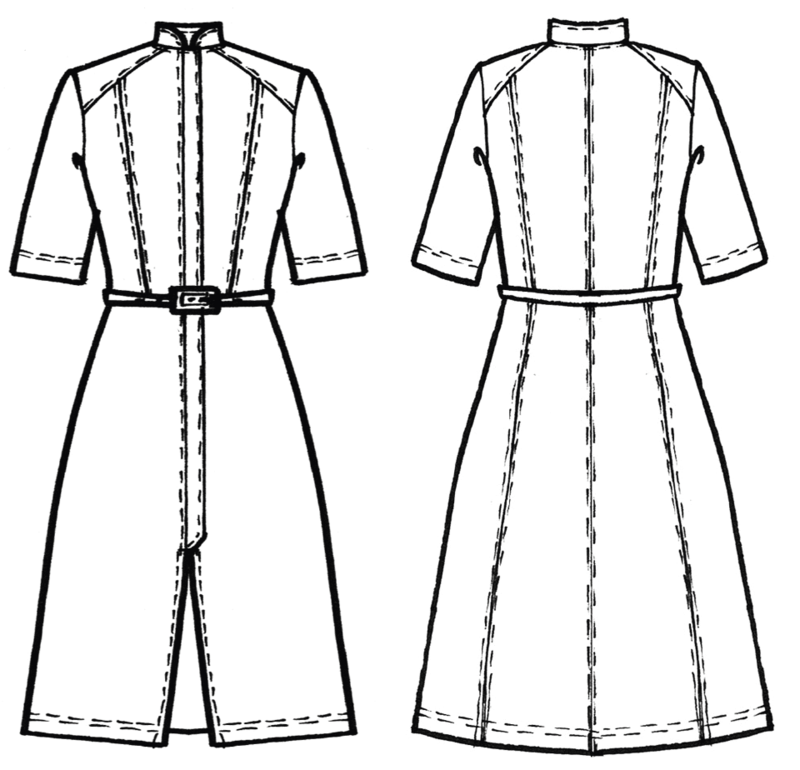 Draw the sleeve cap line and the lower sleeve line as shown in the illustration. Measure ó of the hem width and draw a line to the elbow line. Measure the hem width (wrist girth plus 2 cm) along a horizontal line. Square upwards and measure 6 cm for the cuff width. Connect these points to a rectangle. Mirror the sleeve pieces over the front and back sleeve fold. Measure the distance from the side seam to the back armhole notch on the back pattern and transfer this measurement plus 0.5 cm to the sleeve. Shorten the sleeve around half the cuff width (here 3 cm). Mark the slit 8 cm long. Measure the sleeve hem width (m) and calculate the difference to the hem width of the cuff (wrist girth plus 2 cm). Place the remaining amount in two deep pleats and three small pleats. Mark the pleat positions and the pleat depth as shown in the illustration. 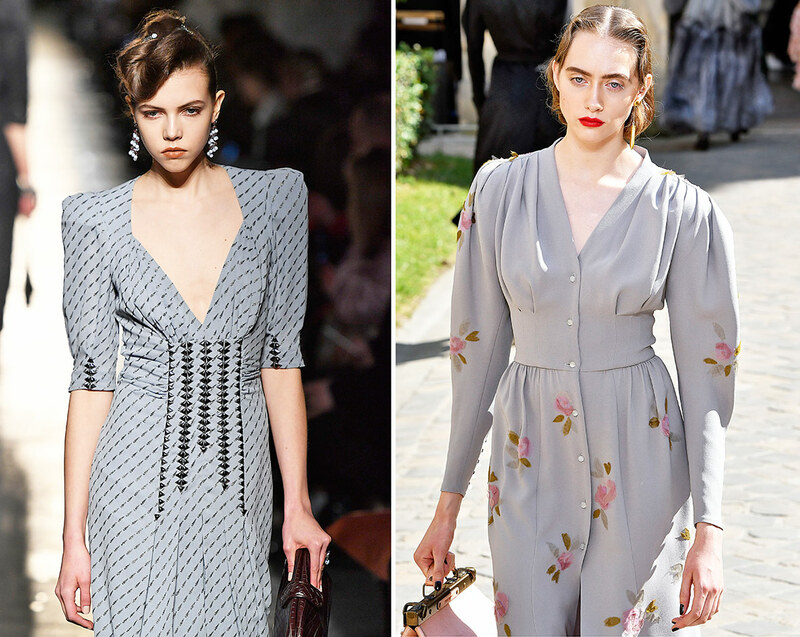 Measure the length of the front and back neckline. Transfer this length minus 0.2 cm to a horizontal line and square up 2 cm. Measure 3 cm upwards for the collar width at the centre back. 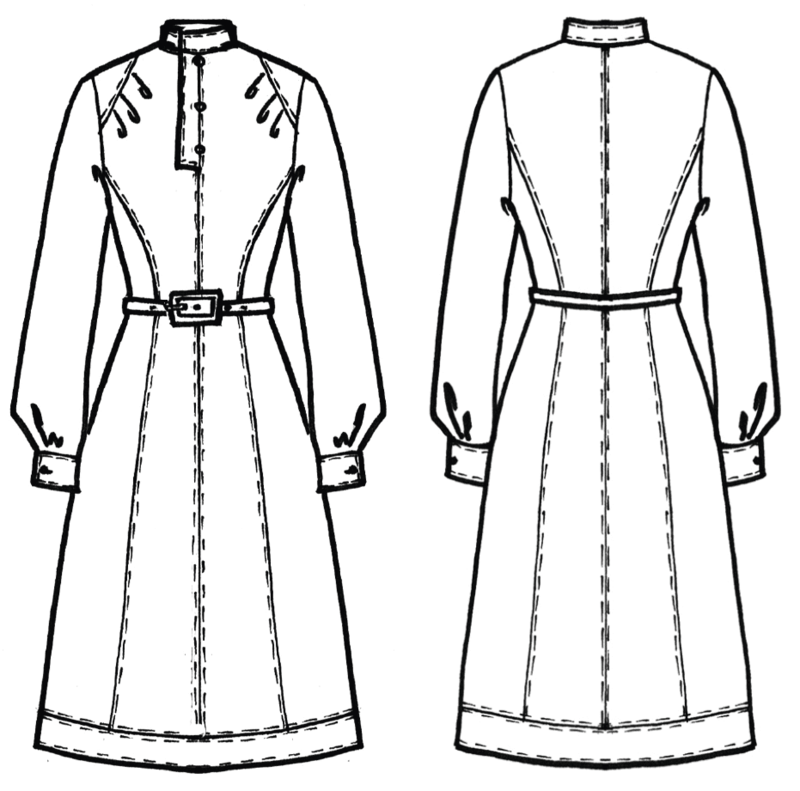 Draw the collar line slightly curved from the centre back to the raised front. Draw the collar line straight from the centre back to the shoulder point and then continue the collar line in a curve. Draw the centre front perpendicular to the collar line. Copy all pattern pieces. Fold the dart and blend the dart hood lines. Add 3 cm overlap and 1.5 cm underlap to the collar front. Add 1.5 cm overlap and underlap to the cuff pattern. In the book Metric Patternmaking for Dresses and Blouses you will find many more basic and model pattern constructions for dresses and blouses. 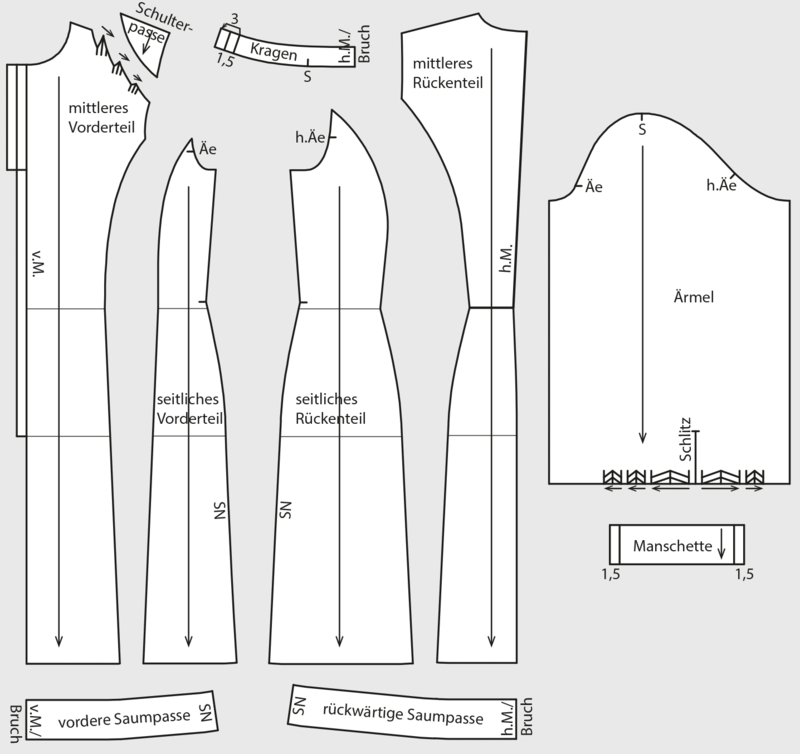 It is a basic edition of the pattern cutting technique M.Müller & Sohn.